(HARLINGEN) – Joe Ramos is celebrating 30 years at Texas State Technical College and a career that was life-changing in many ways. The 52-year-old is now the maintenance mechanic at TSTC in Harlingen, but he started as a part-timer in the custodial department in 1988 when the college was Texas State Technical Institute. The San Benito native grew up a migrant worker, traveling to Northwest Texas every summer with his family to work in the cotton fields and gins of Memphis, Texas. “It wasn’t my favorite thing to do during summer vacations, but it’s what put food on our table and a roof over our heads,” said Ramos. For Ramos, working in the fields was temporary; it was not something he wanted to do forever. However, at 17 he got married, dropped out of high school and fou nd himself at the gins working maintenance, even during off-seasons. It was then that Ramos realized he would not get far without a proper education, so he and his wife moved back to the Rio Grande Valley. Through a federally funded job training program, Ramos was able to earn his GED diploma and start working at TSTC. Through the years, Ramos has grown with the college, even completing his certificate in Welding Technology and becoming a certified welding inspector. To this day he continues to learn and is currently enrolled in TSTC’s Continuing Education National Center for Construction Education and Research (NCCER) Electrical Level 1 course. 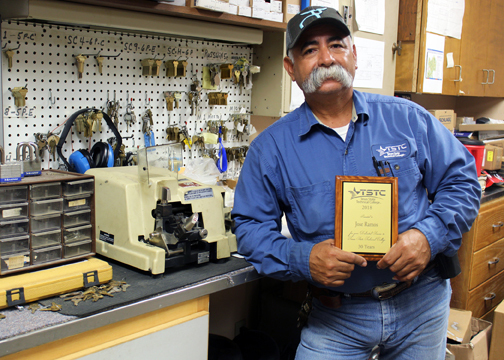 “TSTC prides itself on being a great place to work, and for me it truly has been,” said Ramos. Ramos’ son, Danny, is enrolled at TSTC in the Agricultural Technology program and is currently interning with the U.S. Department of Agriculture. “TSTC really has given my entire family opportunities and has changed our lives,” said Joe Ramos. TSTC Building Maintenance Supervisor and Interim Physical Plant Director Roberto Chapa has worked with Ramos for 10 years and said he is a great asset to the TSTC family and is proud to have him on his team. Ramos said he hopes to be at TSTC for another 30 years — as long as he is still able to work and TSTC will have him. This entry was posted in Harlingen on July 23, 2018 by Amanda Sotelo Sotelo.